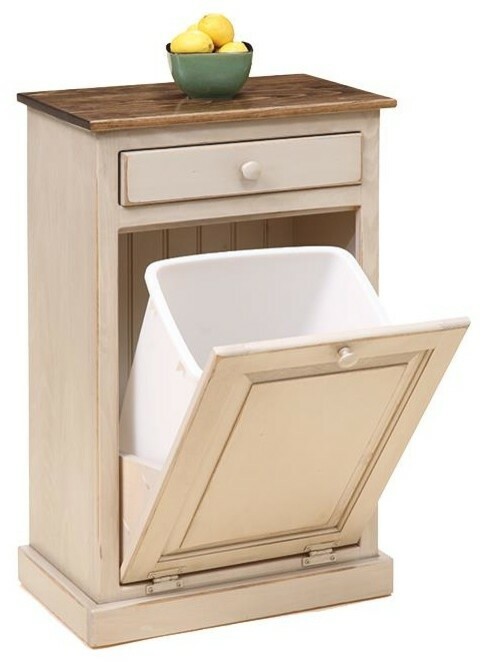 Prior to the integration of appliances and other kitchen accessories, trash cans were non-sequiturs of the kitchen design world. Now, homeowners can enjoy a high-end kitchen design while also keeping their trash out of sight. 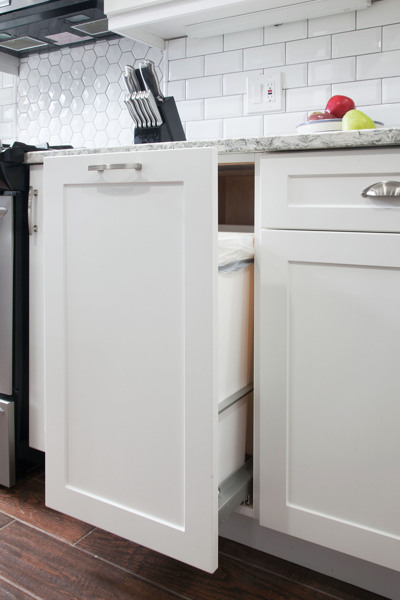 Depending on your kitchen design, you may opt to have a completely streamlined approach—making trash container(s) indistinguishable from the rest of your cabinetry these concealed storage solutions will keep your kitchen looking streamlined and sleek. 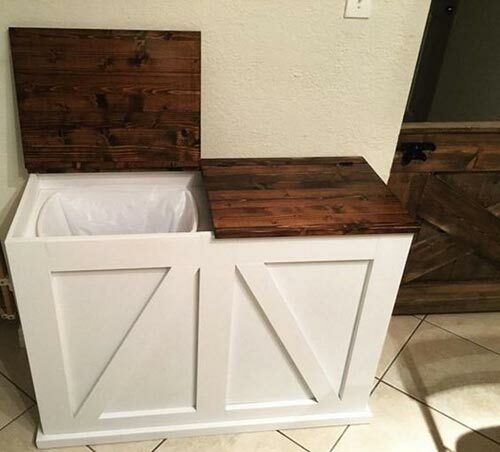 Or, you might prefer to use the trash container as a way of adding character, texture or contrast. Here are some clever and stylish ways to sneak your trash into the kitchen without anyone noticing. In addition to hiding your garbage, these methods also prevent kids or pets from gaining easy access to last night's scraps. If you're going the integrated route, roll-out garbage containers are the way to go. You can select options including a stainless-steel bin that accommodates the bag, or a roll-out section of cabinets that houses a separate, standard kitchen trash can. Either way, this method includes a matched cabinet-front, typically located adjacent to the sink, that glides quietly in-and-out. 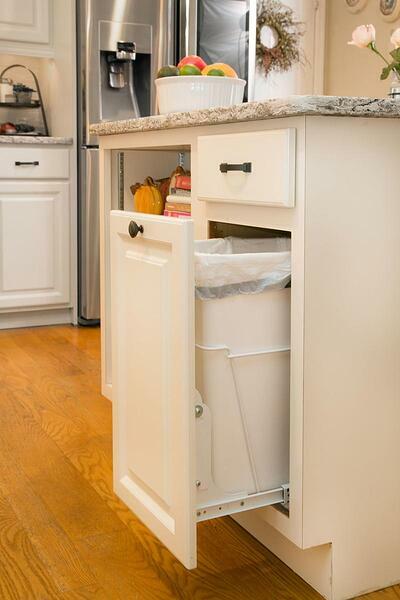 Pull-out or tilt-out trash options (see next) are recommended for homeowners desiring an accessible kitchen design. A similar method operates on a tilting hinge, rather than a slide-out system. They can be built into your perimeter or island cabinetry, or you can purchase stand-alone options that give you placement flexibility. If you go the tilt-out route, make sure to invest in a high-quality unit with a strong hinge system so heavier loads don't wear out rotating or extension mechanisms. For those on the handier side, this could even be DIY’d. Another popular, stand-alone option is the lift-top box (also a DIY-able option). With this style, you can add as many receptacles as make sense for your space and your needs—all within the same structure. For example, you can include a bin for trash and additional bins for recycling and composting. Consider using different colors or finishes for the box and the lift-tops for visual interest. If you're tearing out your old cabinetry, you could potentially re-purpose some of the boxes and doors to build a lift-top box that compliments the new design. Have a traditional kitchen design? Or perhaps a contemporary kitchen that's so glossy that it needs some textural dimension? 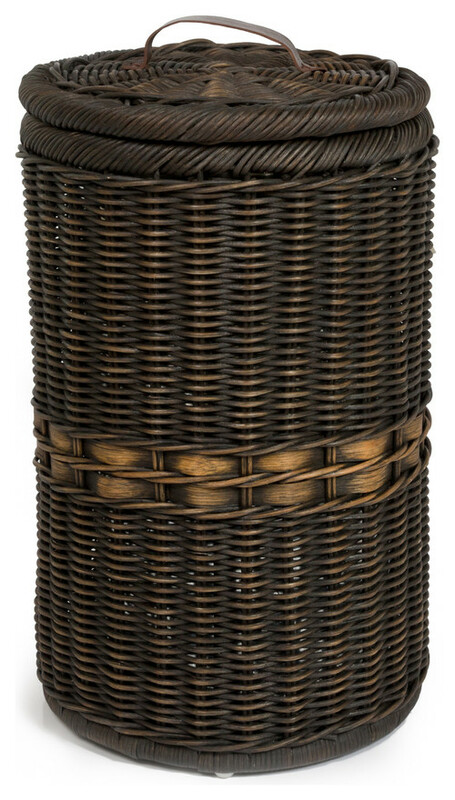 Wicker trash containers are built to house a standard, kitchen trash can and can be purchased in faux-wood options that are resilient, easy-to-clean and durable. Frugal-friendly DIYers can also look for used wicker options and paint them any color in the paint spectrum. 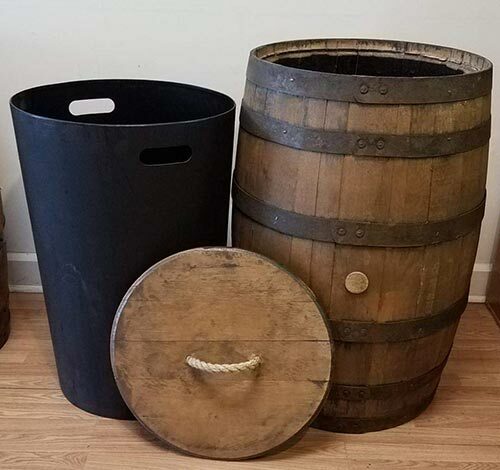 Smaller and more manageable than wine barrels, whiskey barrels are a fun, re-purposed alternative to the typical kitchen trash can. They come with their own lid and liner—ready for you to whisk(ey) the trash away. The design team at Kitchen Magic has all kinds of tricks up our sleeves when it comes to kitchen designs that hide the unmentionables. Schedule a free, in-home design consultation to learn more.